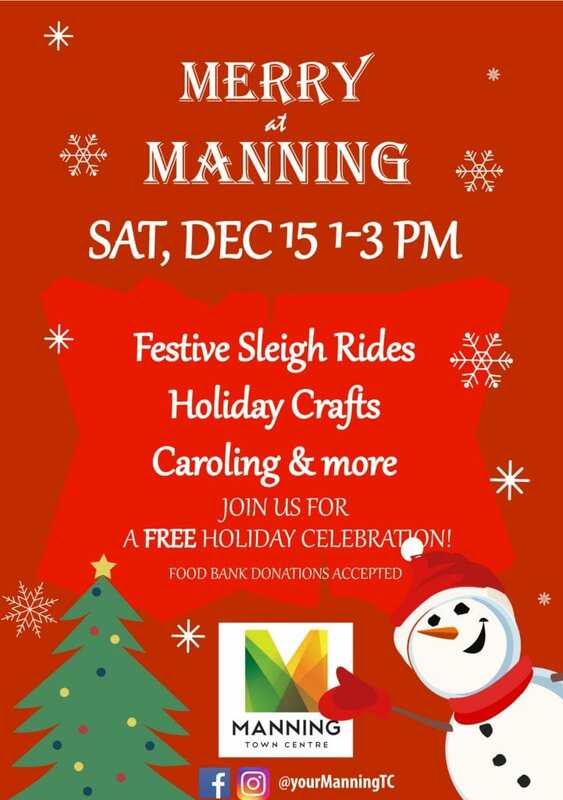 Manning Town Centre happily invites you and your family to Merry at Manning, an afternoon of FREE festive fun on Saturday, December 15th, from 1-3PM! Enjoy holiday crafts, horse-drawn sleigh rides (yes, you heard that right! ), carolers & more! Heated tents will be available to help you warm up, as well as festive cookies and refreshments. In the spirit of giving, we will be collecting donations for Edmonton’s Food Bank. You can find a list of their most needed items in the link below. Donations are encouraged but not required. We invite you to bring your family and your merry self and celebrate the holiday season with us! We look forward to seeing you there!